Interact with the applet below for a few minutes. Then, answer the questions that follow. 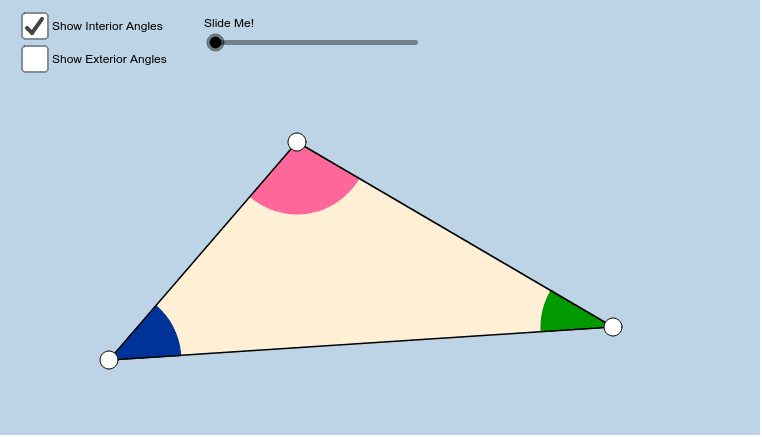 Be sure to change the locations of the triangle's WHITE VERTICES each time before you drag the slider!!! 1) What geometric transformations took place in the applet above? 2) When working with the triangle's interior angles, did any of these transformations change the measures of the blue or green angles? 3) From your observations, what is the sum of the measures of the interior angles of any triangle? 4) When working with the triangle's exterior angles, did any of these transformations change the measures of the green or gray angles?